In the mid-19th century, the railroad was destiny. Railroad company decisions about where to build their lines could make or break towns. Such was the case with Troupville and Valdosta, Georgia. Initially, Troupville had been the seat of Lowndes County, but when the Atlantic and Gulf railroad bypassed the town, county residents lobbied the state legislature to build a new county seat that was on the new rail line. In 1859, the state bought 140 acres from a private landowner and incorporated Valdosta, which was named after a plantation owned by former governor George Troup. Valdosta, just 20 miles from the Florida border, grew as a regional railroad center. By the 1930s, the town was home to seven branch lines of three different railroad systems. Not long after Valdosta was linked to the new national transportation network, Jewish immigrants took the train to the growing south Georgia town to seek their fortunes. They formed the roots of a community that still exists today. Among the first Jewish families in the area was the German-born Ehrlich family. Abraham Ehrlich left Europe as a young man and settled in Savannah, where his uncle George Ehrlich already lived. When the Civil War broke out, 20-year-old Abraham enlisted to fight for the Southern cause. He was captured by the Union at the Battle of Jackson, Mississippi, in 1863, though he was later released in a prisoner exchange. In September of that year, his arm was severely wounded at the Battle of Chickamauga, and he spent over a year recuperating in a Savannah hospital. After the war, he worked as a clerk for a wholesale grocery business. He soon met another German Jew, Benjamin Kaul, who had also fought for the Confederacy. The two decided to go into business together in Valdosta in 1866 after the railroad was rebuilt linking the growing seat of Lowndes County to Savannah and points westward. Their general store, called Ehrlich & Kaul, was initially successful, as several of Abraham Ehrlich’s family members soon joined him in Valdosta, including his Uncle George, who opened his own retail and wholesale dry goods business in town. Kaul and the Ehrlichs seem to have been welcomed in Valdosta. The local newspaper editor praised Jews for their social responsibility and their caring for their own, contrasting them with the recently freed slaves living in the area. The local editor in Valdosta in 1868 applauded the growing population of Jewish immigrants in town since they helped to offset the “spreading niggerism” of the town’s surging African American population. From these editorials, it is clear that Southern Jews like Kaul and Ehrlich benefited from the anti-black racism that would shape the South for the next century. Treated as white people, Kaul and Abraham Ehrlich quickly adapted to the local culture, although their effort to enter the Southern planter class soon led to their economic ruin. The two partners borrowed a large sum of money and rented 250 acres of a nearby plantation, hiring four former slaves to raise cotton and corn on it. When the price of cotton dropped, they were unable to pay their debts; they were also unable to collect from their store customers to whom they had extended credit. Kaul and Ehrlich closed the business and moved to Bainbridge, Georgia, where they were able to open another store. Ehrlich’s brother Lewis took over the former space where Ehrlich & Kaul had once been. Abraham Ehrlich died in 1870 from the lingering effects of his war wound. George Ehrlich, Abraham’s uncle, and his family remained in Valdosta until the last of the Ehrlichs left in 1888. In the late 19th century, Jewish immigrants from Russia began to settle in Valdosta. Most notable perhaps was Joseph Marks, who had left Russia for the United States in 1877. After spending several years in New York and Pennsylvania, Marks moved his family to south Georgia in 1892, where he opened a dry goods store in Valdosta. According to historian Louis Schmier, Marks became known as “King of the Jews” for his leadership in the small community. Marks helped new Jewish immigrants get adjusted to life in the rural South. He also mediated disputes that arose within the Jewish community. It was under Marks’ leadership that Valdosta Jews first gathered to worship together in 1894. Joseph Marks led these initial Yom Kippur services, which were held in a rented room above the Merchants bank. It was not until 1908 that the group officially incorporated as the Valdosta Hebrew Congregation. Several of the congregation’s members were from the small towns outside of Valdosta in south Georgia and north Florida. The greater Valdosta Jewish community was small, numbering about 30 families in 1910, but close-knit, with many members coming from two towns in Lithuania, Baisagola and Seduva. Many of these Jewish immigrants were religiously observant, and the early services of the Valdosta Hebrew Congregation were Orthodox. By 1907, the community had hired Hyman Levin, a shochet who could slaughter kosher meat and also lead services. For the next few decades, the congregation hired a series of shochets/chazzans, which reflected the members’ desires to maintain traditional Jewish dietary laws. Initially, these shochets were paid $2 a week plus room and board and usually had to work in a local store to supplement their incomes. Despite their adherence to Orthodox worship, the congregation sought to downplay the differences between themselves and their Gentile neighbors. In 1907, the group held a public Shabbat service on a Friday night on the steps of the Valdosta courthouse to show the rest of the town what Jewish worship was like. Joseph Marks periodically stopped the service to translate the Hebrew prayers for the interested onlookers. The Valdosta Hebrew Congregation acquired a Torah soon after it was founded, and members soon pushed to acquire a permanent house of worship. The congregation tried to purchase an old church, but the effort fell short after Joseph Marks had a falling out with the group and Ben Pearlman, another important leader of the Jewish community, died. In the meantime, the congregation met in member’s homes and rented rooms. Some members were satisfied with this, but another faction, led by Morris Handelman and Abe Pearlman, pushed for the construction of a synagogue. The women of the congregation played an important role in the effort to raise money for the building fund, holding bake sales, dances, and other fundraisers. Congregation members solicited both Jews and non-Jews in the area. After purchasing land on Smithfield Place, they began construction of the synagogue in 1919, dedicating it on Rosh Hashanah in 1920. The building of the synagogue was a remarkable feat for a congregation that only numbered 42 families. The new synagogue prompted the congregation’s movement away from strict Orthodox practice. Indeed the building itself required compromises. The congregation wanted the building to be close enough to people’s homes that they could walk to services on Shabbat, but the only available parcel made it impossible to build the synagogue facing east, as is traditional. After much discussion, Abe Pearlman’s argument that the direction didn’t matter since all their prayers went up to God carried the day. The group decided that fulfilling the commandment of walking on Shabbat was most important, yet some members would turn away from the ark and face east when they stood up to pray in the synagogue. Perhaps the most controversial issue with the new synagogue was its seating arrangement. The building was constructed with a separate balcony section for women. A group of women, led by Annie Lazarus, balked at this separate section since they had played such an important role in raising the money for the building. Lazarus, who was native-born and college-educated, challenged this gender segregation on the first Yom Kippur in the new building, when she left the balcony and sat down next to her Russian immigrant husband Sam. According to the story, Lazarus asked her husband loudly, “in bed together, but in shul apart? You can have it one way or the other – apart or together.” Sam and the rest of the congregation relented, and women were no longer confined to the synagogue balcony during services. By instituting mixed-gender seating, the Valdosta Hebrew Congregation had begun its evolution into a Conservative congregation. Annie Lazarus was a central figure in the early history of the congregation. In 1921, she founded the Women’s Auxiliary, whose primary purpose was to raise money for the maintenance of the synagogue. Later, the group also raised money for outside charities and oversaw the cemetery, which had been purchased in 1930. In 1925, Lazarus led the way in organizing a Sunday school, which produced some controversy as some members complained that having religious classes on a Sunday had Christian implications. Lazarus argued that Sunday was the only practical day since so many members lived outside of Valdosta and would be unable to attend class during the week. In its first year, the school had 17 students. The Women’s Auxiliary, which had been renamed the Sisterhood, also oversaw the religious school. In 1947, the Sisterhood became affiliated with Hadassah. World War II helped to transform Valdosta and its Jewish community. In 1937, 82 Jews lived in town, along with a handful in the surrounding towns. 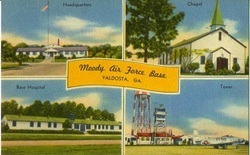 During the war, the U.S. military opened the air base Moody Field north of town; it later became Moody Air Force Base, which has since become the area’s biggest employer. Valdosta’s population grew from 15,595 people in 1940 to 43,724 in 2000. Its Jewish community grew as well, from 82 Jews in 1937 to 230 by 1960. Some of this growth can be directly attributed to Moody Air Force Base. Richard Wilson was an airman from New York City who was stationed at the base during the Korean War. He married a local woman, Hylda Morris, whose parents owned a pawnshop in town. After his discharge from the Air Force, Wilson remained in Valdosta, where he opened the Playland Toy Store, which eventually grew into a chain of 40 stores across the region. The growth in Valdosta’s Jewish population soon led to calls for a new synagogue. In 1960, the congregation built a new home on Bay Tree Road with a social hall, kosher kitchen, and five religious school rooms in addition to a sanctuary that could seat 100. They named the building “Temple Israel.” By this time, the congregation had been able to hire ordained rabbis to lead it. In 1961, Rabbi Samuel Zakuto arrived in Valdosta and led the congregation for the next 16 years. The congregation joined the United Synagogue of Conservative Judaism, though it has dropped its membership in recent years for financial reasons. Valdosta Jews also founded a Jewish social organization, the Twin Oaks Fraternal Lodge, which had a clubhouse with a swimming pool. The Valdosta Jewish community has never been large, but it has remained vibrant. By 1986, the congregation had 58 member families. 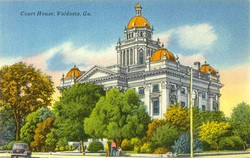 It has grown along with the rest of Valdosta, as the city has emerged as a military, educational, and medical center of south Georgia. For the first century or so of Valdosta’s Jewish history, most Jews were involved in business, many in retail. Over the past several decades, there has been an influx of Jewish professionals associated with Valdosta State University, the South Georgia Medical Center, or corporations who have located regional operations in Valdosta. Congregation member Steven Wilson purchased a Hillel building for the 50 or so Jewish students who attend Valdosta State University. In 2009, there were approximately 100 Jews in and around Valdosta. Temple Israel remains an active center of Jewish life in the region. They hold weekly Friday night services and Saturday morning services once a month. They have recently redone the interior of their synagogue. Valdosta’s Hebrew Congregation has long helped the smaller congregations in south Georgia. Rabbi Zakuto would travel to Waycross once a week to lead their religious school. The congregation also entered into an agreement with the Fitzgerald Hebrew Congregation for the Valdosta rabbi to officiate at Fitzgerald life cycle events. Each year, the Valdosta Hebrew Congregation holds a corned beef fundraiser, in which they serve as many as 5,000 kosher corned beef sandwiches to local residents craving a “taste” of Jewish culture. Since the arrival of the first Jews in 1866, Jewish life has flourished in Valdosta, and seems poised to continue well into the 21st century.